When Dr. Stacey Keen, a radiologist, viewed her own screening mammogram, she immediately knew she had cancer. Defeating Breast Cancer: A Physician's Story of Healing, Martial Arts and Life maps out her journey through diagnosis, treatment, and triumph. In telling her story, Dr. Keen relays not only her mental and emotional journey, but also her experience with complementary medicine (acupuncture) and her traditional course of treatment (surgery followed by chemotherapy and radiation therapy). Dr. Keen is candid, witty, and knowledgeable, and she offers a unique perspective as medical expert, patient, and survivor in one. Doctors, as well as cancer patients and their loved ones, will come away from her uplifting book well-informed, less apprehensive of life-saving treatments, and armed with invaluable resources. Dr. 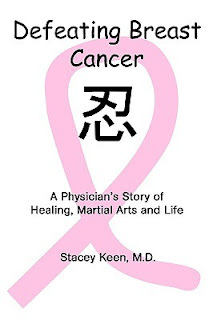 Keen's tale of survival brings encouragement, hope, and empowerment to anyone struggling with breast cancer or other life-threatening illnesses. Humor, positive attitude, and the best of Eastern and Western philosophy and medicine: I enlisted them all to maximize my chances of survival and to grow through this experience. Those who seek a somber tome about breast cancer should look elsewhere. Those who stay with me through these pages will glimpse a way of coping with cancer that I hope can brighten their lives. Stacey Keen, M.D., practices Radiology in Maryland, where she lives with her husband, Andrew Alpert. A third-degree black belt, Dr. Keen has studied Bujinkan Ninpo Taijutsu since 1990. Stacey is giving away a $25 Gift Card! This giveaway begins November 2 and ends on November 13. Winners will be contacted via email on November 14. I've been having shoulder and neck pain for quite some time now, only to have temporary alleviation by monthly massages. I decided to give acupuncture a try so I found acupuncture-mississauga. Great location, very clean, and professional.